However the decision has been made and whatever the rights and wrongs the country, the whole world, must accept that it is the Los Angeles Rams and not the New Orleans Saints that will represent the National Football Conference (NFC) in Super Bowl LIII against the immovable empire that is the New England Patriots. A failure by the match officials, late in the game, to call what seemed like an obvious penalty for taking out a receiver before the ball had arrived (that this is a penalty is often a surprise to many who don’t follow gridiron football) is what has for some cast doubt on the validity of the Rams victory. 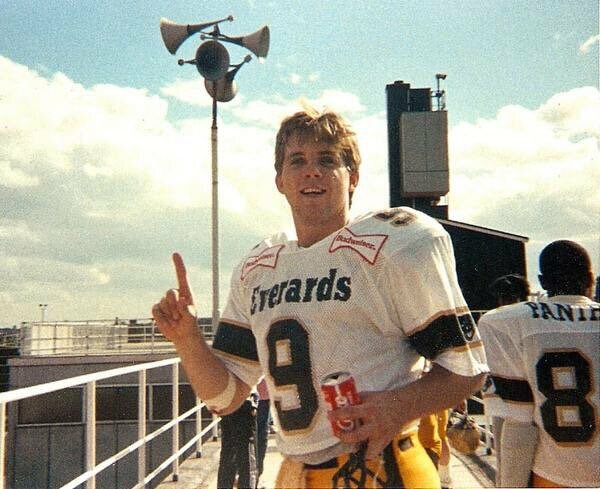 There doesn’t appear to be a good reason to compare the controversial manner of the Saints defeat to Brexit though, even if their head coach Sean Payton spent summer 1988 playing quarterback for the Leicester Panthers American Football team in Britain’s then top flight Budweiser League. But it is the angry, emotional response at a second semi-final stage defeat, in as many years, by the coach, who masterminded the Saints 2010 Superbowl win, that leads to an analogy with the fall out from the June 2016 vote that Britain should leave the EU. A decision, two and a half years on, that has yet to be fully implemented and still faces calls for it to be overturned, or at least for the vote to be re-run. Payton was a quarterback who never quite managed to even make journeyman. His career highlight, after bouncing around the indoor arena league and a stint with Canada’s Ottawa Rough Riders, was probably a brief spell, in the autumn before his English summer, as the QB for the Chicago Bears scab team during the 1987 NFL players’ strike. How his season based in England’s East Midlands influenced him we don’t quite know but his reaction after Sunday’s loss doesn’t suggests he took on board what Britain likes to see as its national qualities of sporting fair play and accepting defeat graciously. Instead he displayed the British characteristic of whinging and wailing at past defeats and mourning former glories. The British obsession with a lost empire is one of the factors that fuelled resentment towards the new order of European cooperation and helped lead to the Brexit campaign. We don’t know Payton’s views on Brexit but, perhaps surprisingly, as an NFL head coach he may well have some. The league believes Britain’s withdrawal from the EU could help it establish a team in London. You can read more on that here. But we know that his response on Sunday overlooked those factors in the game, other than the referees, he had some control over. His play calling and clock management have all been highlighted as decisions Peyton must take ultimate responsibility for that contributed to the defeat. And this is where the true lesson lies in comparing reaction to the Saints heartache with the response to the Brexit vote. A campaign has grown for a further referendum on the Brexit issue – a call which unsurprisingly has led to accusations that it is simply a losers’ vote intended to return a different outcome to the last poll. More about crying over a loss than accepting it graciously. While there were faults with how the 2016 referendum came to be held, and serious questions whether the result can deliver any benefits, those calling for a further referendum need to address the issue as to why they failed to convince the public of the strength of their arguments the last time. So far their analysis seems to extend to leave won as it came up with the snappy term Brexit which the public was able to easily identify with, whether they were for or against the idea. In response those calling for a further referendum have coined the term ‘People’s Vote’ – seemingly oblivious to the insinuation that the last referendum, in which more than 33.5 million people voted, wasn’t a people’s vote, or that a new vote would be one for the right people. One vote one Thursday in June shouldn’t be forever binding and the current inability in Parliament to progress that mandate may lead to the circumstances in which the question should soon be returned to the people. But that’s where those campaigning for Britain to stay in the EU need to consider how what they did, or didn’t do, in 2016 influenced the vote either in favour of remaining, or to leave. Peyton’s adopted UK home city bucked the national and local trend by voting, narrowly to remain, but across the English Midlands the public voted solidly to leave. Midlands seats in Parliament are highly competitive and this probably explains either the reluctance or reticence of some MPs, especially Labour, to speak out in favour of over turning the referendum result they despair at, or at least asking for confirmation from the public. Despite Wales also backing Brexit, by only a slightly higher percentage than the UK as a whole, Welsh MPs with leave voting constituencies don’t seem so afraid of being in open disagreement with the public. This may be a consequence, in contrast to the Midlands, of the notoriously uncompetitive nature of Parliamentary seats in Wales where Labour holds many safe seats. Remain supporting MPs, from counties that voted to leave, may also be boosted by some polling figures that suggest the Welsh public are willing to reconsider the 2016 decision. A remain vote in a further referendum shouldn’t be taken for granted or seen as a cure-all for Britain’s Brexit woes. But a report of a meeting of the ‘People’s Vote’ campaign in Cardiff, in the Western Mail on Monday, January 21, offers little hope that lessons have been learned by remain campaigners. Jeremy Miles, the Welsh Government minister with responsibility for Brexit, was criticised by Plaid Cymru MP Jonathan Edwards for “parroting” the Labour Party line and, according to the newspaper, failing to give “unqualified support to the campaign for a People’s Vote”. Some of the report appears to be based on a “confidential agenda leaked to the Western Mail” suggesting Wales for Europe, which was supposed to deliver a remain majority in 2016, isn’t yet ready to be fully transparent on its campaign plans. But unamed sources who spoke to the Western Mail seem blind to learning the lessons from 2016. According to the report there was “disappointment” at Miles who spoiled the event, last weekend, by mentioning in his speech a Neath constituent “who had told him he could see no reason to change his decision to vote Leave at the referendum in 2016”. In credit to Wales for Europe chair Geraint Talfan Davies, a mainstay of the Welsh establishment which is another criticism of the remain campaign, he acknowledged Miles had been “candid” and presented campaigners with “useful challenges” and Davies recognised the need to win any referendum “decisively”. Sean Payton will surely have another chance for a run at the Super Bowl in September. By then the experienced coach will have moved his focus to closing out victories rather than leaving his team’s fate to the referees and the bounce of a ball. Those campaigning for a further referendum must also learn from past campaigns to secure a different outcome if given the chance as well as explain why the public should vote again. This entry was posted in Life, Uncategorized and tagged American Football, Brexit, Britball, Geraint Talfan Davies, Jeremy Miles, Leicester Panthers, New Orleans Saints, NFL, NFL quarterbacks, People's Vote, politics, referendum, Sean Payton, Wales, Wales for Europe. Bookmark the permalink.